Baking, cooking, and entertaining - the vegan way! Happy Mabon everyone! Mabon is the celebration of the Autumn Equinox. Mabon is the time of harvesting our gardens, orchards, and crops. It's also a time of letting go, a time to honour our loved ones who have passed, and to say goodbye to summer. Let's celebrate autumn today by baking and cooking what we have harvested from our gardens or have picked from our trees and vines. Decorate the dinner table with lit candles, apples, pumpkins, herbs, and flowers. Treasure this time with your friends and family. As the autumn winds blow in the darkness, may you be safe and warm in the comfort of your home. Line 2 large baking sheets with unbleached parchment paper, set aside. In the bowl of your stand mixer fitted with the dough hook, stir in yeast, 1 cup lukewarm almond milk, 3 T melted butter, sugar, pumpkin, flax seed egg, and salt. Gradually add the flour and knead on medium-low speed until the dough pulls away from the sides of the bowl. Knead the dough for 5 minutes; you may add 1 T of additional flour at a time if the dough seems to sticky. Transfer dough to a greased bowl and cover with a clean kitchen towel. Let rise for 1 hour. Gently punch down the dough after it has risen and divide the dough into approximately 15 balls. Place them on the lined baking sheet. Slightly press down each ball using the palm of your hand. Using a sharp knife or kitchen shears cut 6-8 slices into each ball. Do not slice all the way into the center. Cover and let rise again for 45 minutes. In a small pot over low heat, melt 2 T of vegan butter with 2 t almond milk. Remove from heat. Using the end of wooden spoon, poke an indentation into the center of each roll. Brush each roll with the melted butter/almond milk mixture. Remove rolls from the oven and insert one pecan into the center of each pumpkin roll. Enjoy them warm under a tree of falling leaves! These are just a few benefits of each ingredient in this smoothie. 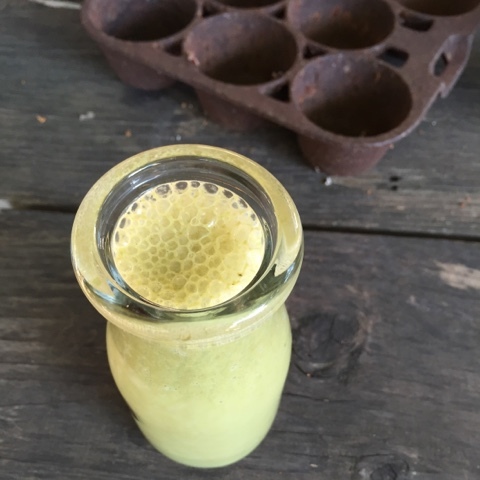 A refreshing smoothie for anytime of day, also a smoothie that will give you health benefits everyday! Today's forecast calls for rain and temperature in the 60's. Now some people would complain about weather like that. Not me! I am done with hot and humid weather. I enjoy working in my garden without passing out from heat exhaustion. 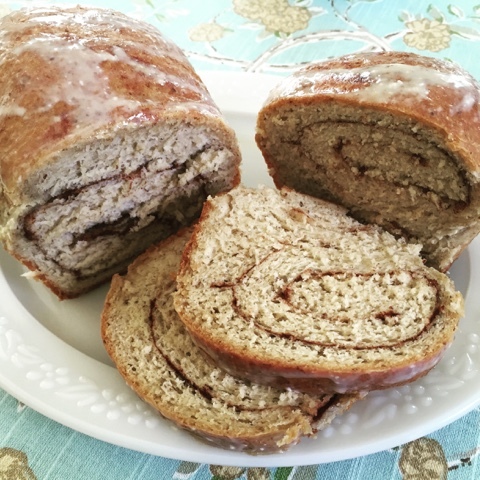 Cooler weather calls for comfort bread, and that bread is called Cinnamon Oatmeal Bread with an Orange Cream Cheese Glaze. Grease 2 medium loaf pans, set-aside. In a large bowl mix together the oatmeal, and boiling water. Add butter, agave nectar, brown sugar, and salt. Set-aside. In the bowl of a stand mixer add yeast, 2 cups flour, and flax eggs. Mix using the flat beater. Change to the dough hook and add 1/2 cup of flour at time. Dough should come clean from the sides of the bowl, knead dough for 3 minutes. Place a clean kitchen towel over bowl and let the dough rise for 1 hour. In the meantime make the glaze. In a small sauce pan over a low flame add cream cheese, orange juice, and sugar. 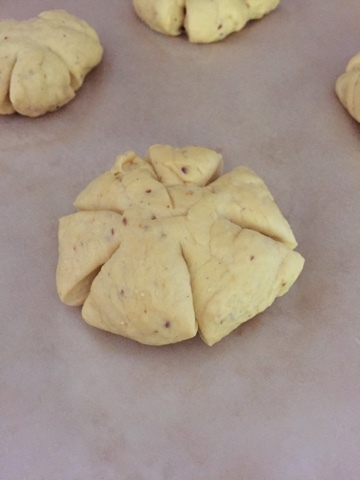 Divide the dough into 2 pieces. Roll each into a rectangle about 8" wide and 12" long. Butter each dough with the melted butter and sprinkle with cinnamon. 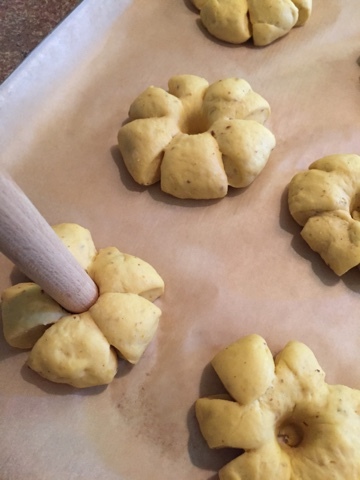 Roll up the dough and press seams securely together. Place each into a pan seam side down. Cover pans and let rise again for 45 minutes. Pre-heat oven to 375 degrees for 20 minutes before baking. Bake on the middle rack for 40 minutes. Can you feel it? I can! Autumn! Autumn is right around the corner! The temps are beginning to drop a tinge, it's getting darker earlier, and I just saw a boat full of pumpkins at the market! 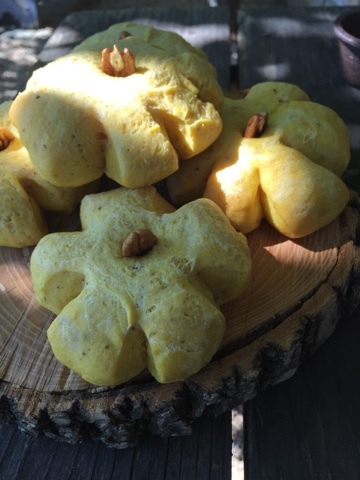 I bake all year, but Autumn brings a barrage of recipes that truly bring us the magical Autumn experience. Apples, cinnamon, and pumpkin are just a few of the ingredients I think of when I plan my Autumn baking. 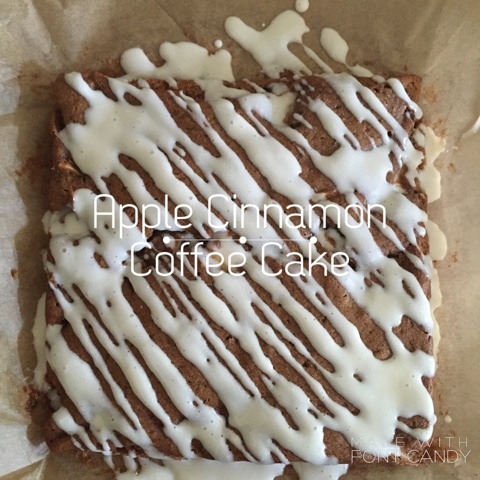 This coffee cake recipe is one to "fall" for that's for sure! I plan on making this cake numerous times this Autumn. Pre-heat oven to 350 degrees. Line an 8x8" baking pan with unbleached parchment paper. In a large bowl, whisk together the flour, cinnamon, baking powder, salt, and baking soda. Set-aside. Using a stand mixer, cream together the Sucanat and butter until fluffy. Add the 2 flaxseed eggs, mix until fully incorporated. Alternate adding the flour mixture and the coconut milk. Stir in apples by hand. Pour batter into the lined baking pan. Bake 25 minutes or until the cake pulls away from the sides of the pan. While the cake is baking start the glaze. In a small saucepan, combine the sugar and water. Stir until the sugar dissolves. Remove from heat and let cool. Place cream cheese in a medium bowl and beat until smooth and fluffy using a hand mixer. Add the cooled sugar mixture and continue beating until you get a smooth glaze. When the cake is completely cooled, pour glaze in long diagonal ribbons. Next, cut yourself a slice, pour yourself a cup of coffee. Sit by a window and start looking for falling leaves. * recipe adapted from Clean Eating magazine. By adding these powerful seeds to your granola, you will adding fiber, omega-3, protein, amino acids, and antioxidants. Combine all of the ingredients in a large bowl. Pour out onto the lined baking sheet. 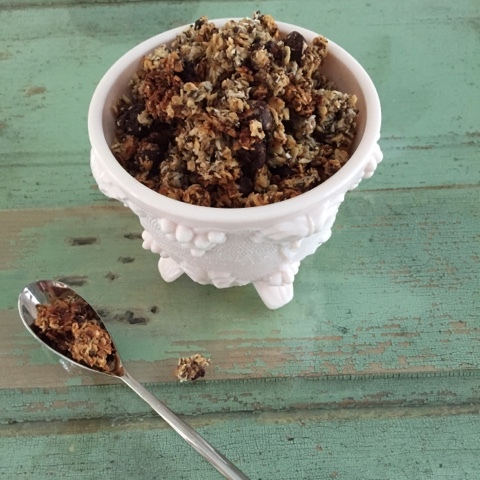 Smooth out granola and bake 35-40 minutes. My new e-cookbook is available for sale! Welcome to the sweet, savory, and scrumptious world of One For You And One For Me! 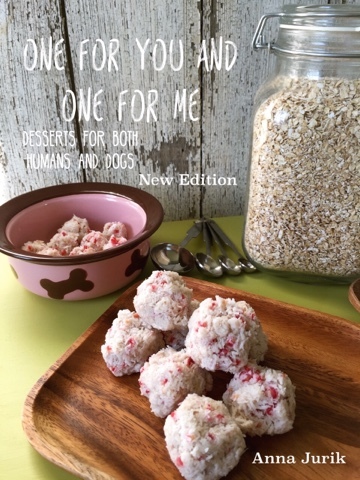 A world where you can bake delectable desserts not only for yourself, but also to share with your furry friend. 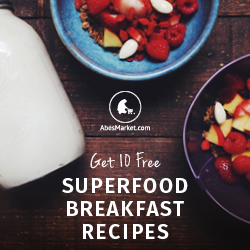 All of these yummy recipes can be quickly and easily executed. No complicated equipment or special baking skills are needed to whip up these goodies. You will be emailed a PDF file of the book after you purchase below for $1.99.